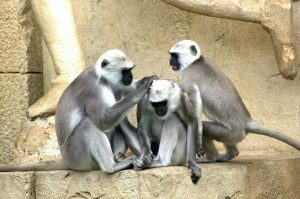 “Not my monkeys, not my circus” is a great line to recite unless, of course, it is your circus and they are your monkeys! Rousing, motivating, transporting and corralling eight children into a pew each Sunday morning often leaves my husband and I feeling like we’re ringmasters of a small traveling side-show. Yet for all of the trouble it can be to present ten people in Mass each week, we know it makes all the difference if we want to keep our children Catholic. Admittedly, I’d like extra credit for choreographing our performance (because without me there’s a good chance a few more heads would turn up unbrushed and there’s no guarantee anyone under 12 years old would have matching clothes). 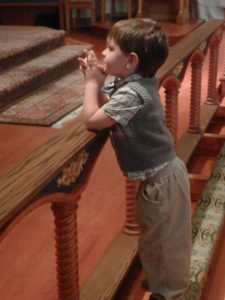 But, the fact of the matter is that my husband’s role at Mass is the determining factor in ensuring that our children remain lifelong Mass-goers. A 1994 survey in Switzerland found that the religious practice of the father decides the future attendance habits (or absence) of the children. According to the survey findings, if both parents regularly attend religious services then 33% of their children will be regular churchgoers for life, 41% will attend irregularly and 25% will stop practicing their faith. Of course, 33% is still a disappointing percentage when we weigh the importance of faith in our journey toward eternity, but according to the Swiss study 74% of a couple’s children continue practicing their religion at least irregularly when dad sets the right example. Without dad’s lead, the statistics decline dramatically. If the mother attends services regularly but the father attends irregularly then a mere 3% of their children will continue on as regular churchgoers, 59% will go irregularly, and 38% will abandon the practice of their faith. Of course, one might argue that the study wasn’t specific to the Catholic faith, that it’s out-dated or that it’s only a reflection of practices in Switzerland. 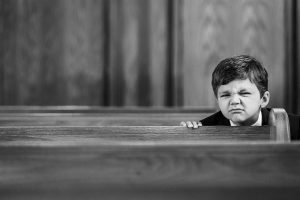 One could argue against the survey’s findings based on these points, but judging by the increasingly empty pews here in American Catholic churches it would be difficult to prove such a stance. While our culture tells us that the role of fathers is easily replaceable, evidence proves otherwise. All of a mother’s good intentions and faithfulness cannot fill the void left behind by an absent father. Children unconsciously look to their father for cues about the world, which is logical considering that God presents to us as Father. Therefore, if their father teaches them by his example that church attendance is unimportant or altogether irrelevant then the kids are going to believe him. Add to this lesson the fact that religious education classes are dominated by female teachers and the adjacent pews are filled with women and the (erroneous) message comes through loud and clear: God the Father doesn’t care whether or not you worship Him. Being a mother myself, I understand the desire as a female to want more credit in this area of formation. However, for all of the valuable blessings God has bestowed upon womanhood, He has not set it to be a replacement for the role of father. Consider the Blessed Mother. God made her Queen of Heaven and Earth. We go to her for aid and follow her virtuous example, but we recognize that she is not the Father. She intercedes on our behalf, but she does not create or command (well, except to command us to do whatever Jesus asks of us). We know the commandments come to us from our Father and we follow them in the hope of entering His kingdom. Children intuitively model their father’s behavior when it comes to practicing their religion for the long-term. No amount of entertainment or creative programs run by mothers will counterbalance the consequence of dad’s empty seat. Show Dad the evidence. Tell him how valuable his role is as a father. Let him know that he is the person God created to head the household and lead the souls of his children toward heaven. Link Dad up with solid Catholic websites that encourage both masculinity and Catholic leadership. Praise the fathers in the pews around you. You don’t have to get overly sentimental. Just welcome them and honor their position in the Body of Christ. Encourage young men to take on leadership positions in the parish and join in fraternal organizations like the Knights of Columbus or the Holy League. 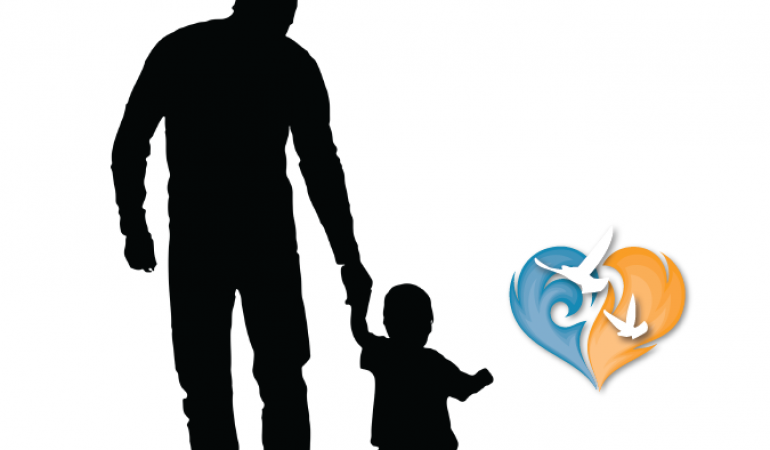 Avoid organizing programs for children at times when fathers are most unable to take part. Schedule Vacation Bible School programs and the like for evenings and then actively recruit fathers to participate. If your child’s father is absent, consider recruiting a grandfather, uncle or other male family member to attend Mass with your family. As a male, reach out to fatherless families in your parish. Encourage the mother and children. Invite them to sit near your family and silently witness to the truth that God wants them to remain close. Pray. Pray for broken families. Pray for fatherless children. Pray for the restoration of the masculine image in the church. Pray for your husband to accept his role as leader and to place God as King over the family. Pray for St. Joseph’s intercession. Stay tuned for my up-and-coming post on how my husband and I trained our big brood to sit through Mass.